The Portland Symphonic Choir, founded in the autumn of 1945, celebrated its 70th anniversary with a festive concert on Sunday afternoon (October 25) at Rose City Park United Methodist Church. The program, which featured a variety of chorale works, also brought together alumni of the choir (including this reviewer) and previous artistic directors – Frank Holman, David Wilson, and Bruce Browne – who shared conducting duties with the choir’s current AD, Steven Zopfi. (Each conductor was introduced with a pertinent anecdote by a member of the choir.) The church was full, and the mood was cheery as members of the 120-voice choir took their places across the front of the sanctuary. Taking advantage of the church’s lively acoustic, the choir excelled whenever a forte was demanded. It also honed a rich texture, crisp diction, and an excellent blend, especially in the first selection, Mendelssohn’s “Hymn of Praise” (“Lobgesang”), which was conducted by Frank Holman (the choir’s AD from 1963 to 1973). Accompanied by organist Douglas Schneider, the singers impressively handled an exposed a capella section very well with no slippage in pitch, and the piece ended majestically. Next to the podium was Bruce Brown, the choir’s AD from 1979 to 2001. He changed things up a bit by reaching back to the Baroque period with Andrea Gabrieli’s “Magnificat.” Dividing themselves into four separate choirs, the singers conquered the lively acoustic that got even livelier because they were accompanied by a small chamber ensemble consisting of strings and brass. That was followed by a spirited performance, with Schneider at the piano, of “Behold! I Build An House” by Lukas Foss. Under Zopfi, the choir sang “The Heart’s Reflection,” a new piece by up and coming composer Daniel Elder. Taking its text from Proverb’s 27:19 (“Just as water reflects the face, so one human heart reflects another”), the music explored the words with many rippling harmonic layers. The soprano section of the choir really sounded terrific in this piece as did the basses who went deep into the basement for some of their notes. The choir’s performance of Hubert Parry’s “I Was Glad When They Said Unto Me” was quite thrilling, with Schneider scaling up the volume of the organ and the choir matching it with grand fortes. For the final number, alums of the choir were invited to come forward and sing the “Halleluja” from Beethoven’s “Christ on the Mount of Olives.” I got to join in on the fun, and I think that we created a glorious sound that helped to cap the concert with a sonic boom of sorts. Overall, it seemed that the size of the choir was still too big for the lively acoustic of the church. I had the feeling that the singers had to hold back their sound even in the loudest passages. If they had given a real double forte, then the varnish might have peeled off of the pews. Veering away from the typical violin or piano concerto, the Oregon Symphony decided to do something out of the ordinary by presenting a harp concerto at its concert series this past weekend. So the concert I heard on Saturday evening (October 24) at the Arlene Schnitzer Concert Hall featured Alberto’s Ginastera’s Concerto for Harp and Orchestra with renowned harpist Yolanda Kondonassis. 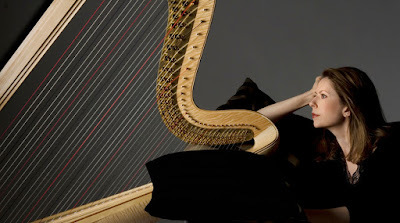 It was refreshing to see and hear the harp front and center on the stage, and Kondanassis, whose career has garnered her accolades galore and given her the moniker of the today’s most recorded classical harpist, gave a gem-like interpretation of Ginastera’s concerto. The Ginastera’s piece had all of the beauty that one would normally imagine with the harp as the solo instrument, but with Kondonassis in command the music went beyond that. In fact, it was fascinating to watch Kondonassis as she strummed the strings to create guitar-like sounds, rapidly picked individual notes that seemed to be all over the place, fashioned glissandi with the nails of her fingers, used the palm of her hand to create a whistling sound, and tapped the frame of her harp to make percussive sounds. Several virtuosic cadenzas transfixed the audience so much that no one coughed or made any noise whatsoever. The orchestra paid extra attention to Kondonassis, keeping its sound from overwhelming hers almost the entire time. Several unusual duets paired the harpist with percussion (soft mallets on cymbals), various woodwinds, and high whispery violins. Ginastera’s music was inventive and transitory, and made me want to hear more pieces for harp and orchestra. Fortunately, after the very enthusiastic applause faded away, Kondonassis treated the audience to a mesmerizing encore, Carlos Salzedo’s “Song in the Night,” (“Chanson dans la nuit”), which contained a lot of the same extended techniques. After intermission, the orchestra turned in an incisive and emotionally charged performance of Tchaikovsky’s Fifth Symphony. Tortelier’s slightly unconventional conducting style – sans baton and often switching the beat from the right hand to left – probably helped to freshen things up a bit. The orchestra stayed right with him, delivering an array of well-crafted dynamics that included some massive crescendos and tapered decrescendos. Ravel’s “Alborado del gracioso” (“The Jester’s Morning Serenade”) received a snappy and spry performance from the orchestra. A combination of wonderful sonic colors, sometimes punctuated by accented notes, terrific decays in volume, and incisive made this piece a witty delight. Precise pointillistic notes from the horns and trumpets and the witty solos from Miller Packwood contributed marvelously, and the Ravel’s music, guided by Tortielier, seemed to dance effortlessly. In today's edition, the Statesman Journal reports that the board of the Salem Chamber Orchestra has decided to cancel the remainder of its season because of financial problems. The 31-year-old orchestra has been struggling to make its $180,000 operating budget. The ensemble, under its music director Nicholas Caoile had planned a very interesting season, including violinist Lara St. John and a special appearance by composer John Corigilano at its next concert in November. So this is very disappointing news. fEARnoMUSIC in collaboration with Artists Repertory Theatre will sponsor two staged readings of a new chamber opera project by local composers John Vergin and Theresa Koon, and local poet and playwright Sandra Stone. The readings will be directed by Allen Nause, and feature some of Portland’s finest singers. fEARnoMUSIC's Jeff Payne will conduct. Advance tickets: $25/$15; Day of show: $30/$20. This project is supported in part by a grant from the Regional Arts and Culture Council, along with generous in-kind support from Allen Nause and Artists Repertory Theatre. For a more complete description of this project and/or if you would like to help fund it, click here. Over the years, I have tended to confine my concert attendance to the Oregon Symphony. This season, however, I am making an effort to check out the lesser known, but still vitally important, ensembles that grace our region. Case in point: the Portland Chamber Orchestra (PCO), which presented the opening program of its new season this past weekend (October 18) at the Agnes Flanagan Chapel on the campus of Lewis and Clark College. The innovative and intriguing program, entitled “Northern Lights,” consisted of works by the Finnish master Jean Sibelius and the Danish composer Carl Nielsen. Music director Yaacov Bergman began the concert with a moment of silence in memory of the victims of the recent tragedy in Roseburg. It just so happened that the opening work of the program, Sibelius’ brief “Andante Festivo,” was ideally suited to follow this remembrance. Originally scored for string quartet, but later arranged for string orchestra and timpani, the work is still played at solemn occasions in Finland. Maestro Bergman elicited sensitive and expressive playing from the strings and timpani. It was an affecting beginning to the concert. Nielsen’s engaging Flute Concerto followed. Jessica Sindell, formerly the principal flutist of the Oregon Symphony, was guest soloist. The concerto, which consists of two movements, features very striking musical dialogue between the soloist and other instruments in the orchestra, such as the trombone, timpani, clarinet, and bassoon. There was even some brief dialogue involving the viola. Sindell provided many memorable moments during her time with the Oregon Symphony. I am pleased to report that her playing remains first rate. She consistently demonstrated a pleasing tone and effortless mastery of the entire register of the flute as required by this demanding work. She was sympathetically accompanied by Bergman and the orchestra with generally well-judged balances, though on a couple of occasions the orchestra did threaten to overwhelm Sindell. Overall, this was a fine performance of this attractive work. The concert concluded with a most unusual presentation of Sibelius’ incidental music to Maurice Maeterlinck’s play “Pelleas et Melisande.” For this performance the PCO presented a semi-staged version complete with actors and visual art. This was said to be a Northwest premiere performance. In general, I found the performance most effective when the actors were unaccompanied by the orchestra and vice versa. When both spoken word and music were simultaneously combined, I found my attention divided, making it difficult for me to fully appreciate either the spoken dialogue or the music. I must confess that I also sometimes secretly wished that the actors would “sing” in the manner of Debussy’s opera when accompanied by the orchestra. Perhaps, this was a reflection of my love for Debussy’s opera. Regardless, however, of how one felt about the combination of spoken dialogue and Sibelius’ music, one must applaud the PCO for thinking outside the box and presenting the play and incidental music in an innovative manner. Certainly, it was hard to find fault with the performance. The actors, Heidi Hunter as Melisande, Gregory Lucas as Pelleas, and Mary MacDonald-Lewis as Yniold were all excellent. I was especially taken with Leo Daedalus’s portrayal of Golaud, the jealous husband of Melisande. His questioning of his own child Yniold about the relationship between Pelleas and Melisande was most harrowing. Maeterlinck’s play about doomed love inspired a number of composers to write music based on that work, ranging from Sibelius to composers as diverse as Schoenberg, Faure and, of course, Debussy, whose opera has challenged and confounded audiences since its premiere. Sibelius' music is perhaps the most accessible. Nevertheless, anyone expecting it to resemble his well-known symphonies would be surprised at how it differs from those great works. With regard to the individual performances, Pablo Izquierdo’s English Horn solos were immaculate. The woodwind playing as a whole was most felicitous. I would also compliment the strings for their characterful playing. The rendering of the lovely "Pastorale" was magical, and the beautiful music accompanying the death of Melisande was deftly executed by Bergman and the orchestra. The audience thankfully remained silent as Sibelius’ music slowly faded way and Bergman's arms fell to his side, signaling the end of the piece and leaving this observer with a great sense of satisfaction. Based on what I saw and heard, the PCO clearly merits increased support from the ticket-buying public, as well as additional critical attention. Curtis Heikkinen became a classical music fan after moving to Oregon over 30 years ago. He is especially fond of 20th Century and contemporary composers. He believes that, in order for classical music to prosper, performers, orchestras, and radio stations must find a way to move beyond standard repertoire. Dvořák’s “Stabat Mater” received a spirited performance from the Oregon Repertory Singers in collaboration with soloists and the Vancouver Symphony at the Newmark Theatre on Saturday (October 17). It was a rare performance of a cantata that apparently has not been heard in Portland for at least 40 years. Written in 1876, the “Stabat Mater” was Dvořák’s personal response to the deaths of his first three children. Based on Jacopone da Todi’s religious poem (written in the 13th century) that described Mary’s grief during the death of her son, Jesus, Dvořák divided the cantata into ten movements, and the performance that I heard, shaped with graceful gestures by ORS Music Director Ethan Sperry lasted almost 90 minutes. The soloists were some of the best from the Portland-metro area. Most impressive was mezzo-soprano Hannah Penn, who sang ardently, with beautiful tone and power. Soprano Vakaré Petroliūnaité’s lovely voice soared and soothed but sometimes needed a tad more volume for the forte passages. Tenor Carl Halvorson’s tone seemed tight and his top notes were tenuous in the first and second movements. He looked more comfortable and sang directly to the audience from his solo in the sixth movement onwards. Bass André Flynn sang with gravitas and vigor but got a bit unsteady in some passages. The 80-plus voices of the Oregon Repertory Singers made the most of the concert space, which is not the kindest venue for an unamplified concert. Using a mixed formation, the choir sang with intensity and sounded best during the unaccompanied section of the finale, “Quando corpus morietur” (“When my body shall die”). The orchestra got into the spirit of the piece, but it needed more rehearsal time to nail down intonation problems and some muddled entrances. The violins did not always have a unified sound during some of their exposed passages, and the tonal disagreement marred their depiction of the heavenward ascent in the last movement. It was also unusual to hear the audience applaud after each movement. For works such as the “Stabat Mater,” applause is usually held until the end of the piece, so that each movement can build emotionally on each other and the listeners can experience the arc of the music and the story conveyed. Projected text could have been a help in this regard, because, unless you know the Latin, it was difficult in the darkened hall to follow the words in the program. Still, the performers did a fine job of working with the dry acoustic of the Newmark, which was built for performances of plays rather than music. Unfortunately, Portland doesn’t have many venues beyond the Schnitzer and the Keller for performances of large scale works like Dvořák’s “Stabat Mater.” And there are many, many cantatas that ensembles like the Oregon Repertory Singers can explore. They deserve a better performance hall. But until one is built, listeners will have to put up with the city’s deficiencies. That is Portland’s cross to bear. Ever since he took over the Oregon Bach Festival from Helmuth Rilling two years ago, Matthew Halls has increased his appearances at the podium of orchestras in North America and Europe. So it was high time that the British conductor made his debut with the Oregon Symphony at the Arlene Schnitzer Concert Hall on October 10th. 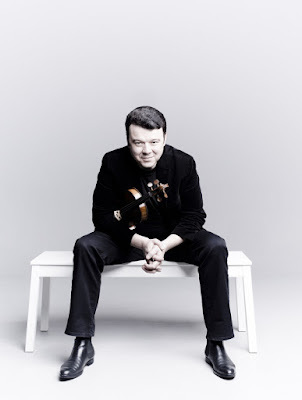 Drawing on his background in Baroque music, Halls put together an intriguing program that offered Beethoven’s Third Symphony, Bach’s “Ricecare” a la Anton Webern, and Sofia Gubaidulina’s “Offertorium,” which featured violinist Vadim Gluzman. Gluzman’s ecstatic performance of the Gubaidulina was the highlight of the evening, but Halls didn’t totally connect with the orchestra in the Beethoven and the Bach. The first two pieces of the program were uniquely linked. A chamber contingent played the “Ricercare” from Bach’s “Musical Offering” in Webern’s arrangement for orchestra. It was executed with pinpoint accuracy so that the notes were traded seamlessly from one colleague to another. The brass instrumentalists, in particular, were quite adept at creating timbres that matched closely. But Halls was mostly a human metronome. The only real dynamic contrast was at the very end of the piece when he slowed the pace slightly and raised the volume; so the piece seemed mostly academic. In sharp contrast, Gubaidulina’s “Offertorium” violin concerto was very expansive and moving. The piece, inspired by Webern’s arrangement of Bach, started in the same way with the trombone leading off, then went down a different path in which themes and variations were explored by both soloist Gluzman and the orchestra, a full-sized contingent that took up most of the stage. Playing with utmost conviction, Gluzman created all sorts of unusual sounds, from those that fluttered in the stratosphere to slip-sliding tones to agitated slashes that were filled with double-stops. The orchestra also played incisively and fashioned a variety of statements, sometimes seemingly in response to what Gluzman did. Guided by Halls, the combined forces did offer a musical sacrifice that sort of paralleled the passion of Christ, with violin soloist taking the role of Christ and the orchestra as his followers and/or foes. It all ended with a huge crash and bang followed by Gluzman alone on a pure, ultra-high note. For Beethoven’s Third, Halls went with a chamber ensemble, pairing the orchestral forces down to five cellos, 8 violas, four basses, and 21 violins, plus winds and brass. After the jolting sforzandos that announced the start of the piece, Halls set a crisp pace, which wasn’t a problem, except that the orchestra went on automatic pilot and actually got ahead of the beat at one point. As a result, some dynamics and colors were not as exciting as they could have been. Still, there were many gem-like moments, especially those created by principal oboist Martin Hébert, principal bassoonist Carin Miller Packwood, and acting principal flutist Alicia DiDonato Paulsen whose lovely playing was the highlight of the evening. When Halls returned to the stage to take a bow, Concertmaster Sarah Kwak paid him an extra compliment by not standing so that he could enjoy the applause. Yet many of her colleagues seemed subdued in their reception of the guest conductor. Sometimes the interaction between conductor and orchestra can be a mystery. The Montrose Trio kicked off the Friends of Chamber Music’s 77th season with sterling performances of beloved piano trios by Franz Joseph Haydn and Felix Mendelssohn, and gave a vibrant interpretation of world premiere of “Temple Visions” by American composer James Lee III. 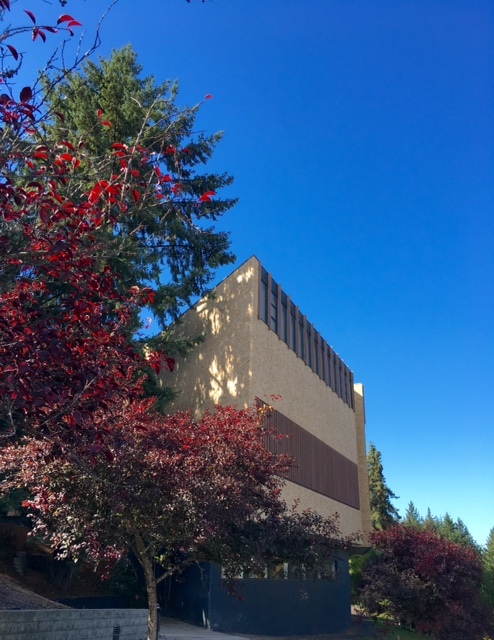 The concert took place on Monday evening (Oct 5) in front of an enthusiastic audience at Lincoln Hall on the campus of Portland State University. Pianist Jon Kimura Parker, violinist Martin Beaver, and cellist Clive Greensmith are well known in Portland, but not in as a trio. That’s because they have collaborated together when Beaver and Greensmith were members of the famed Tokyo String Quartet, which, before it disbanded in 2013, often played with Parker. Speaking of Parker, one of the coolest things about him in this concert was his ability of listen and adjust the dynamics of his playing with to perfectly compliment that of his colleagues. He found the lightest textures and crafted sounds that were sparkling clear and natural. Consequently, the blended sound of the ensemble was exquisite, especially during their playing of Haydn’s Trio in E Major, which moved along gracefully yet with a twinkle in the ears. A firework of virtuosic technique by all members of the ensemble was on display during “Temple Visions,” which was co-commissioned by the Friends of Chamber Music. According to the program notes, written by Lee III, the four-movement piece was inspired by “the design and history of the Hebrew temple from the Bible,” and in particular through the Book of Revelation.” Fast and furious playing by all members of the ensemble aptly reflected the opening movement, “Internal Conflict.” The second movement, “Galactic Districts” reveled in nervous energy. The third movement, “A City Mourned,” featured a lovely and expansive cello solo by Greensmith at the outset. The fourth, “Final Resolutions” was propelled by clashing and driving currents – as if each musician was striving for the upper hand in a contest that threatened to spill out of bounds. If nothing else, “Temple Visions” was an exhilarating piece, and I would love to hear it again to make more sense of its direction. The ensemble delivered a wonderful performance of Mendelssohn’s Trio in D minor, and I loved Greensmith’s buttery smooth sound. But he should have played a little louder whenever he took over the theme. That would have taken the ensemble’s interpretation up just a hair higher. Responding to the standing ovation, The Montrose Trio gave a heart-stomping, scintillating encore, the scherzo from the Shostakovich Trio. Concert goers had to catch their breath on the way to the exit. One of the nation’s best wind quintets, The City of Tomorrow, will play a fascinating program of new music at The Old Church on Thursday (October 8) at 8 pm. The program consists of works by Karlheinz Stockhausen, Franco Donatoni, John Aylward, and Nat Evans. You will hear a lot of unusual sounds, including five conch shells. The ensemble consists of Elise Blatchford, flute; Stuart Breczinski, oboe; Rane Moore, clarinet; Nanci Belmont, bassoon; and Leander Star, horn. I spoke with Blatchford to find out more about COT and the concert. Blatchford used to live in Portland and is now living in Memphis, Tennessee where she is a tenure-track professor on the faculty of the University of Memphis. Here is part of our conversation (edited for brevity). How and when did The City of Tomorrow begin? Blatchford: The quintet has evolved quite a bit since starting five years ago. Originally, almost everyone was at Northwestern University except for me. I was living in Chicago at that time. Initially, we really enjoyed rehearsing more than performing. We started with rarely performed pieces written by composers like George Perle and Franco Donatoni. 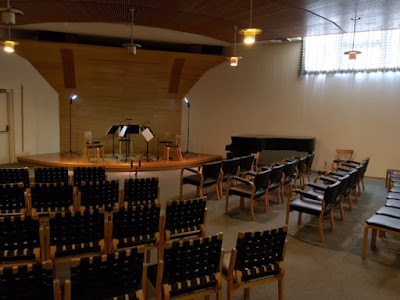 Then we did one concert and followed that by driving to Notre Dame, Indiana to compete in The Fischoff National Chamber Music Competition, and won it – something we didn’t expect to happen! That just launched the group. But by that time we had already lost our clarinetist, who won a job. Since then, all of us have moved. Two of our members live in New York City, one in Boston, and Leander and I live in Memphis. Since most of you live in different places, how do you rehearse? Blatchford: We get together periodically to rehearse. We usually meet in New York, and will rehearse for five days in a row. That often happens when we add a new piece, or we know that we will be going on tour. Then we build in some more rehearsal time before a tour. In New York, we’ve been able to get a rehearsal room at Carnegie Hall, which is terrific. I read that the name of your group is derived from a poem by Billy Collins. Blatchford: We really enjoyed the Billy Collins poem, “The City of Tomorrow.” It’s about a person who loves the pulp science fiction from the 30s and 40s, and he is wondering what the future is going to look like. Would it be this bright shiny thing or something more complicated? We thought that idea worked well with a lot of the music that was written in the mid-century. It was music that thought it was going to be one thing, then things turned out something else. I feel that a lot music – for example, the Donatoni piece that we are going to play at The Old Church – has this certain idea of what the future is going to sound like. Now that we are in 2015, we realize that things being composed today sound very different. How do you determine the pieces that you will play for a particular concert? Blatchford: We have an overarching concept that we have been working with for the past two years. It has to do with our recording project. We just released our first album in May. It’s called “Nature,” and it is part of a series – Nature, Machines, and the Apocalyptic Sublime – that we are doing. So we have talked to composers about natural apocalypse, the effect of machines on modern-day humans, and how we are affected and overwhelmed by technology in our lives and how that cross-pollinates changes that are occurring in the world right now with climate change, habitat destruction, and other things that are happening in the natural world. So we are looking at those larger ideas and finding pieces that seem to fit into those themes or help to propel those themes. Hence the theme of “Wax Wings” and the piece entitled “Daedalus” that you will be playing in Portland? Blatchford: Right. We commissioned that piece from the composer John Aylward, who was inspired by the legend of Daedalus and Icarus and how technology can sometimes accidentally destroy things that we hold dear. We thought that was a beautiful metaphor for thing that we grapple with today. John is a friend of our clarinetist, and he lives in Boston. The piece sounds way different that the other pieces on our program. It has a lot of unusual timbres and uses a lot more extended techniques than the other pieces. For example, I’m playing alto flute on that piece, and I do a lot of speaking through the flute and air sounds. There’s some slap tongue that comes from the clarinet. Sometimes the bassoon is played without a reed. I watched the video of your ensemble’s playing of Nat Evans's “Music for Breathing” and found it really intriguing, especially with the conch shells. How long did it take you to learn how to play the conch shells? Heck, where did you get them? Blatchford: There’s a fellow called the Conch King. You can find him at conchking.com. He will make you a conch shell horn. So we ordered five of them! They are actual shells. He drills a hole at the end and fits them with a brass-mouthpiece-ring. You buzz into the shell – like you do with a French horn. Leander has been coaching us on conch shell technique. We are not virtuosic with them like Stuart Dempster, but we do create lots of tones and chords. Nat is from Seattle. He does a lot of site-specific sound installations. Two of us worked with him on one of them, and we liked his music a lot. So he wrote a piece for us that we can take with us. Tell us about Dantoni’s “Blow,” which is also on the program. Blatchford: One of the cool things about this piece is that it doesn’t require any extended technique at all, and it’s in a straight 2/4. It is a spectacular woodwind quintet with a lot of tutti sections plus solos and duets. It has some jazz influences. The music has so many fresh things to say. We want to get it out in the public, and we hope that more groups will play it. How about the Stockhausen piece? Blatchford: “Rotary” is part of a large opera cycle that he called “Licht,” which means light. It reflects the seven days of the week. “Rotary” is an arrangement from a scene in “Mittwoch,” which is Wednesday. In the score, it prescribes us to surround the audience; so we rotate around the stage and seating area. So the balance of a chord may change as we are rotating around the room. Every instrument plays a different character. There’s the character of Eve and the angel Michael. There’s also the devil, which is represented by a hissing sound like a snake. Blatchford: We typically do two to five tours. This summer we plan to record another album. That takes up a lot of time. Will your CD “Nature” will be available at the concert? Blatchford: You bet! And we will be delighted to sign it too! Over the past several years, there has been considerable discussion about the need to alter the way classical music is presented to the public. The Third Angle New Music program (Light and Music in Aalto’s Library), presented at the Mount Angel Abbey on Sunday (October 4), provided a glimpse into one possible future for classical music concerts (at least for small ensembles). The concert I attended was one of six given over the course of two days and was designed to celebrate the Abbey Library. Third Angle’s imaginative program featured works by two Finnish composers: Magnus Lindberg’s Clarinet Quintet from 1992, and Einojuhani Rautavaara’s “Herran Rukous” (“The Lords’ Prayer”) from 1973. The program also included two Gregorian Chants, the “Antiphon for St. Benedict” and “Psalm 8,” by the Capella Romana vocal ensemble. The program specifically consisted of an initial recital in which the quintet was performed, an audience exploration of the library, with accompanying sounds and words, and a finale that featured the vocal works. Magnus Lindberg is certainly one of our most important living composers. His body of work includes a large number of orchestral pieces, including his Clarinet Concerto from 2002, a work that deserves a Portland performance, and a substantial number of works for smaller ensembles, including a superb trio for clarinet, cello and piano from 2008. The clarinet trio is probably a little easier listen than the clarinet quintet, which consists of a single movement just shy of twenty minutes long. Lindberg has described the piece as “insect like,” which would not be an unreasonable description. A dissonant work of great intensity, the quintet features an attractive beginning in which the clarinet commences the proceedings, after which the strings quickly join in. The score thereafter is quite dense. For me, the most interesting portions of the work occur at roughly the 10 minute mark. At that point, after some relatively introspective passages for the clarinet, the intensity is increased substantially as the clarinet explores the extremes of its register. The effect was seemingly one of extreme anguish. For an admirer of musical dissonance, this was heady stuff. It was at this point that the insect analogy seemed most appropriate. The intensity decreased a bit toward the end of the piece, which ended ambiguously with the clarinet dispatching the final notes in a manner that reminded me somewhat of the finale of Sibelius’s Fifth Symphony. Before the concert, I had some concerns about the unusual format that required the musicians to play this demanding work three times on Saturday and three more on Sunday. Sitting in on the next to last performance, I wondered if the considerable demands of the piece would result in some loss of focus after so many performances. My concerns were quickly put to rest. Louis DeMartino gave a bravura performance of the demanding clarinet portion, which required him to play continuously. He was ably accompanied by violinists Ron Blessinger and Greg Ewer, violist Charles Noble, and cellist Marilyn De Oliveira. The performance hall was suitably intimate and, from where I sat in the rear of the hall, comfortably contained the extremes of pitch. After completion of the recital portion of the program, the musicians led the audience to the library, where we were encouraged to explore the magnificent facility as the string players spread out to various stations where they drew their bows across wine glasses filled with precise amounts of fluid. This was intended to create a perfect pitch designed to match the resonant frequency of the building. 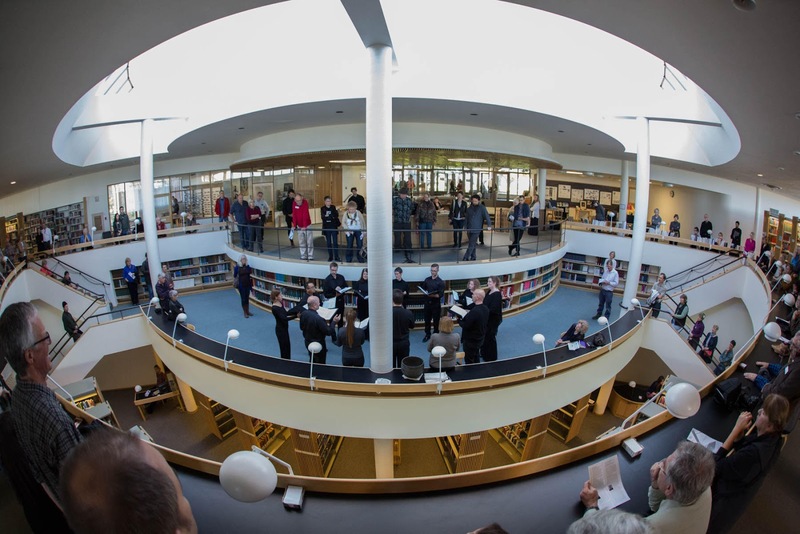 The eerie sound effect continued as members of Cappella Romana recited the words of the library’s architect, Alvar Aalto, at various positions throughout the library. Any initial discomfort I may have felt as a result of this most unusual way of integrating audience and library into the program quickly dissipated. It seemed a most ingenious and effective way to introduce the audience to the beautifully designed library. Eventually, the members of Capella Romana gathered in the center of the library for the recitation of the Gregorian Chants. I expected a lot from that ensemble and was not disappointed. The members performed the chants with a lovely tone. The concert concluded with the Rautavaara’s “The Lord’s Prayer” for mixed choir, which featured exquisite balance and faultless intonation. Given the library’s fine acoustics and spiritual nature of the work, the conclusion to the concert was most moving. 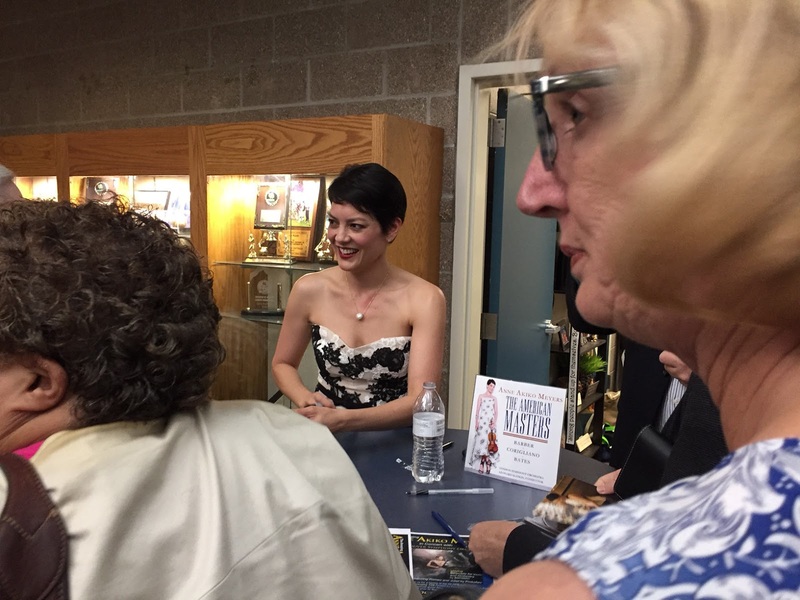 Violinist Anne Akiko Meyers’s sensitive, yet exhilarating playing of Bernstein’s “Serenade” (after Plato’s “Symposium”) swept everyone away at the Vancouver Symphony season opener on Saturday afternoon (Oct 3) at Skyview Concert Hall. Wielding immaculate technique, artistic finesse, and a deep understanding of the music, Meyers wonderfully conveyed Bernstein’s somewhat esoteric music in a personal, tangible way. That’s no small feat, considering that the “Serenade” deals with the ideas spoken by seven Greek philosophers on the topic of love at a dinner party about 2,400 years ago. From the first notes, sotto voce, at the beginning of the piece, Meyers effortlessly created gorgeous tones from her violin, the Vieuxtemps’ Guarneri del Gesu. Even at stratospheric heights, her violin exuded sounds that were as smooth as silk. But Meyers could also deliver amazingly crisp staccatos as well as precise, finger-flashing runs. The call and response setup between Meyers and the orchestra in the quick third movement (“Erixymachus”) and the transcendent calm of the fourth (“Agathon”) were highlights of the concert. The orchestra, guided by Salvador Brotons, rose to the occasion with excellent playing, but I would have liked a little more intensity and a bit more zip at the end when Alcibaldes and his cohorts crash the party. However, the duet between principal cellist Dieter Ratzlaf and Meyers in the fifth movement (“Socrates; Alcibaldes”) was a gem. Following a sustained, standing ovation, Meyers and the orchestra gave an encore, the “Love Theme” by Ennio and Andrea Morricone from the movie “Cinema Paradiso” in an arrangement by Angela Marley. When announcing the piece to the audience, Meyers said that it would be dedicated to the victims of the horrible tragedy in Roseburg, and all on stage played the piece with great feeling. Some tentative entrances and intonation problems hindered the orchestra in its performance of eleven movements from Prokofiev’s “Romeo and Juliet.” Still, there were plenty of dramatic moments, including the ponderous bass trombone and tuba passages in “The Montagues and the Capulets,” the mellow alto saxophone line in “Friar Laurence,” the blend of the woodwinds in the “Minuet,” and the surging horns in “Romeo at Juliet’s Grave.” Concertmaster Eva Richey executed her solos exquisitely. Brotons and the orchestra had fun with the Overture to Bernstein’s opera “Candide,” which was the concert’s curtain-raiser. The melodies percolated along and all sections of the orchestra handled the trickiest passages cleanly, but a faster tempo would have made the piece more delightful. During intermission, many concert goers lined up to get their programs signed by Meyers. She also signed her CDs, including her latest, which features the Bernstein “Serenade” and the “Love Theme” from “Cinema Paradiso” as well as other pieces from the stage and film. But even for those who didn’t get a signature, Meyer’s performance will be remembered as one of the best ever on a Vancouver Symphony program. This weekend, acclaimed violinist Anne Akiko Meyers will play Bernstein's "Serenade" with the Vancouver Symphony (WA). I wrote a preview of the concert, which was published by The Columbian newspaper. The piece draws from a French Advent plainchant dating back to the 15th-century in which the orchestra repeats four chords from its refrain. You could hear those chords especially in the brass sections. They settled nicely into the background – sort of a foggy blur against all of the things that Currie and other parts of the orchestra did in the foreground. 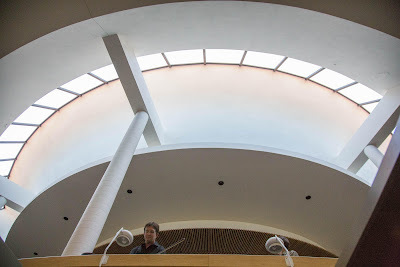 And there was a lot going on – from the robust fanfare of the “Introit,” which were accented by some very loud smacks on the gongs – to the rolling waves of overtones from the tubular bells and the myriad of metal pieces that the orchestra members struck during the “Coda” at the end of the piece. Some of the pummeling that Currie did on the various drums and blocks seemed aggressively loud, but it did convey a sense of urgency in the piece, which sought to present a world in agony and in need of redemption by the coming of Christ. That urgency was supported initially by slashing sounds from the orchestra, including eerie high notes from the strings. It all progressed or digressed into episodic blasts and sonic convulsions that seemed to cry out for a resolution. That resolution came when the orchestra members began to strike the little metal pieces that hung from their music stands and Currie calmly walked to the back of the orchestra and began to intone the incredibly tall tubular bells. The blend of overtones from the bells along with metal chimes was heavenly. The orchestra also performed four tone poems from Bedřich Smetana’s “Má vlast” (“My Country”). The double harp introduction, exquisitely played by Jennifer Craig and Jenny Lindner, to “Vyšehrad” (“The High Castle”) was one of the highlights of the evening. Flutists Alicia DiDonato Paulsen and Sarah Tiedemann created marvelous swirling sounds during “The Moldau.” Memorable moments from “Šárka,”included the snoring tones from Adam Trussell’s bassoon, which were followed by a fast and furious finale that seemed to scorch the air. “From the Woods and Fields” contained a wonderful fugue that travelled through all of the string sections as well as a lovely French Horn and clarinet choir. Overall, the orchestra, guided deftly and very expressively by Carlos Kalmar, evoked a magical landscape of sounds that made the piece thoroughly enjoyable. The opening piece on the program was a delightful number by Luigi Cherubini. Nothing much of Cherubini’s many works is performed today, but Beethoven regarded Cherubini as his greatest contemporary, and, indeed, Cherubini’s influence can be heard in Beethoven’s “Fidelio.” The Oregon Symphony played the Overture to Luigi Cherubini’s opera “Ali Baba, ou les quarante voleurs” (“Ali Baba, or the 40 Thieves”) with carefree élan. The strings put on a real show with snappy articulation during passages that blitzed by in a few seconds. The spry yet careful exchange of brief phrases between each section of the strings down to the cellos was immaculately executed. In the midst of it all, Niel DePonte tapped the triangle and his colleagues in the percussion section added a Turkish flavor to the music. In that small way, Cherubini number became an excellent lead-in to the MacMillan piece. Another big thank you to Bob Priest, Mr. March Music Moderne, for compiling this information! Simon Rattle - City of Birmingham Sym. Orch. Usually, I try to take notice of the movement of musicians in an out of the Oregon Symphony roster, but somehow I keep forgetting to check up on Aaron LaVere, who has been the orchestra's principal trombonist 2001. Starting last year, he was still listed as the principal trombonist but on leave. I didn't think much about it, because a few years ago, he took a leave to serve as the principal trombonist of the Seoul Philharmonic Orchestra. Well, one of my colleagues asked me what has happened to LaVere, so I looked him up on the web and found out that he has taken over the principal trombonist desk at the Baltimore Symphony. We are going to miss his terrific playing, but fortunately the OSO has enlisted Daniel Cloutier as acting principal. Cloutier is the principal trombonist of the Grant Park Orchestra, which happens to be Carlos Kalmar's summertime band. In other news, I attended the annual meeting of the OSO, and found that that the orchestra has extended an offer for the principal flute position. This month, orchestra will be holding auditions for the principal clarinet position.